Would You Stay at Hogwarts Overnight? I’ve never been to the Wizarding World of Harry Potter, but I’ve been fascinated by the idea of it for years. I love the idea of getting paired with a magic wand, and who wouldn’t want to drink fresh butter beer? 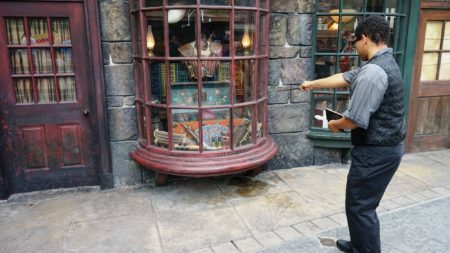 I was all the more intrigued when a friend informed me recently that you can now get fully interactive wands at the Wizarding World. At certain places in the park, if you wave the wand the correct way, something “magical” will happen (a knight will move, a flower will bloom, etc–see video here). Sure, it’s an illusion, but where else do you have the opportunity to get actual results from a magic wand? Here’s what I decided: I want to stay in a hotel that looks, feels, and acts like Hogwarts. That’s right. Both the outside and the inside of the hotel would look and feel exactly like Hogwarts. When you arrive, you would be sorted into your house, and that’s where you’d stay. You’d eat meals in that giant dining room. You could explore in your free time or play a game of Quidditch. And so on. It’s almost so obvious that I wonder if there’s a reason Universal hasn’t already done it. They certainly have the set designers to make it look and feel like Hogwarts (in fact, they’ve already built a version of it for the theme park–it’s just not a hotel). They’ve had the time to build it. I can’t imagine it wouldn’t be worth the investment–wouldn’t it be the first choice of anyone going to the Wizarding World? What am I missing? And, most important, would you stay at the Hogwarts Hotel? This entry was posted on Tuesday, January 30th, 2018 at 8:37 pm	and is filed under books and tagged with books. You can follow any responses to this entry through the RSS 2.0 feed. I’d definitely be up for a trip to Wizarding World! And if staying at Hogwarts was an option, sign me up! Being a childless person at an amusement park isn’t so bad, or at least it wasn’t weird when I interned at Disney and would spend days off in the parks with other program participants going on rides and seeing the attractions. The key is to go during the school year before too many kids are out for summer break to make the place that much more crowded. There is no reason to avoid the Wizarding World just for the fact that you’re a childless adult! I would say a large part of the people walking around there are without kids, or the kids are quite older (considering a lot of parents don’t let their kids read the books, or wait until they are close to Jr High). I would definitely stay in a Hogwarts hotel, that’d be amazing! I’m guessing they haven’t done it yet just for the space alone. The current Hogwarts is a ride. They’d need to build the hotel outside of the park so anyone can stay in it. Land around Universal Studios (I would say in both locations) is sparse, so that is probably the reason it hasn’t happened. I’d stay at the hotel, but my fear is that Molly would lie to the Sorting Hat and say she’s a Hufflepuff or something, and then she couldn’t room with me in the Slytherin quarters.